I love baseball and I coach baseball and I’m a fan of the Pittsburgh Pirates. Recently I received an email from Pirates.com asking me to vote for pitcher Chris Resop for the Roberto Clemente Award which annually goes out to one player in major league baseball who selflessly gives back to the community. It’s a very prestigious award. It was nice to see that Chris was being nominated since my son holds Roberto Clemente in very high esteem, and Chris’s father happens to also coach my daughter. Let’s look at the initial email that I received. Seems pretty harmless and it’s an email that goes out to all subscribers of Pirates.com. So when I go to vote for Chris, I am taken to the following landing page below. The first part of this is what you would actually see above the fold. Which is poorly designed I might add. When do I expect to purchase or lease? Please indicate the Chevy vehicle I want to learn more about? I would like to receive further email communications from Chevy. 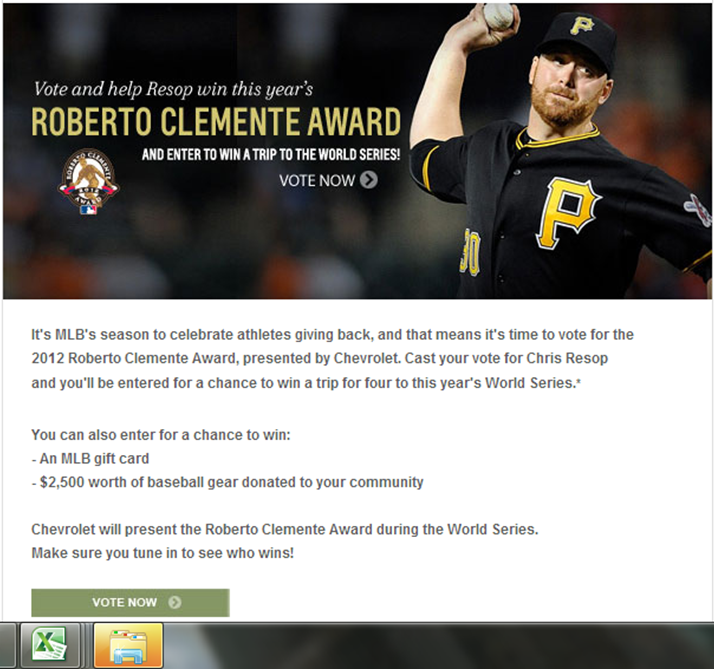 I don’t remember this having to be part of voting for the Roberto Clemente Award. I also notice that I have no choice but to answer the questions in order to vote for Chris Resop. So if I don’t want to use this form, do I really want to take the time and effort to “look” for a work around? What if I want my 12 year old son to vote? I don’t even know if he likes Chevy’s yet! What can Chevy and MLB learn? You have to give people options when filling voluntary information out that’s only relevant to Chevy. Know who you’re sending emails to. Know your audience. Surely MLB and Chevy have pretty decent CRM systems. Know that sometimes the primary focus doesn’t have to be on lead generation. Think about the cause here. The devil is in the details, and the details were poor and misleading. The form will invariably bring back bad information of people who really don’t care about a Chevy, they just wanted to vote. You have forced bad or misleading information into a system and have corrupted the data. You’ve tainted a good cause with large assumptions. Add a social component on the email and the web page for crying out loud. I hate to say it, but this is a case study on bad email marketing. Hopefully this email didn’t go out to 20 million people; and wait till I tell Chris Resop’s dad about this! This entry was posted in Email Marketing, Emarketing and tagged chevy, chris resop, Email Marketing, mlb, roberto clemente award by marc meyer. Bookmark the permalink. In my opinion, Chevy and MLB both come off as tacky and opportunistic. Something else that jumped out at me was the initial CTA — “Vote for Resop and enter to win a trip”. This comes off as deck stacking on the part of Chevy in favor of Resop. When you do research into the campaign, it turns out that a vote for any player enters you for a chance to win — however this is not clear from the email. While I get that this was sent to a Pirates list, I’d rather see something that is less “club loyalty driven” and more focused on individual merit. At the end of the day, this award isn’t about baseball rivalries and competition, but about individuals affecting individuals. Completely agree Jeremy, So I can’t just vote on Chris’s merits/ I have to be incentivized/ or you think I need to be, in order for me to vote. We’re not voting for all-stars here. At the end of the day, the marketers from both orgs., in a way have completely diminished the award, the nominee and what that person has done in the community. It actually shouldn’t be a fan vote in a sense. But either way, I agree tacky and opportunistic are good descriptors. Ha! This is why I never got around to voting for Ryan Zimmerman for the Clemente Award. I was unwilling to give Chevy information so that they can spam me.